Send a unique save the date that will be sure to make an impression. Custom designs and shapes that hang elegantly on the tree or in a window. 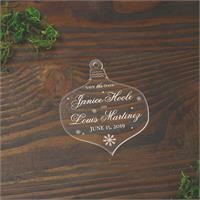 Create a custom ornament to celebrate a special year or occasion. A perfect gift for newlyweds (and even not so newlyweds). Have your own unique design for an ornament or special project? Choose one of our eight shapes, upload your design, and we will do the rest! Front and back printing available.